Tintin is a classic comic book character that has recently been brought to life in the movie collaboration between Steven Spielberg and Peter Jackson. A journalist investigating various mysteries around the world, Tintin has been the companion of many a child growing up in and around Europe, although he has been a relative unknown in the USA up until the movie. I feel the movie really captures the sense of adventure and humour of the original stories perfectly, but have Gameloft managed to get that feeling with it’s iOS version of the film? Well, this may not be the best game in the world, but it is a perfectly balanced adventure that happens to be a supremely smart release from Gameloft. The reason for this is the genre; a third person, linear action game with a feel of a graphic adventure spruced up by decent mini-games. If Tintin had been designed purely from the comics for the traditional fans, then this would have definitely been a graphic adventure, and if it had been aimed straight at new fans of the movie then we would have had a third person collectathon. As it is, Gameloft manage to tread the fie line between the two genres well, with a thoughtful and well produced adaption that should please anyone who downloads it. 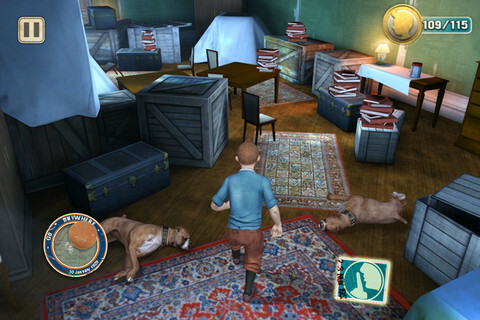 The game follows the plot of the film, and starts with Tintin and his trusty dog Snowy on the trail of a thief who stole their recently purchased model ship. The adventure soon develops and you will find yourself sneaking around mansions, escaping ships and even partaking in a spot of pirate sword fighting. You use the touchscreen to move around and use the camera in the same way as most 3D games on iOS, and you have the ability to run or walk slowly for a more stealthy approach. Gameloft have got the controls spot on here, as there are many sections where you have to move very carefully around objects without touching them and there is never a problem. There are some platforming elements that are dealt with well, and even a hint of Uncharted with some climbing sections. Sometimes you get to control other characters other than Tintin, such as Snowy. It is in an early section of the game where you have to guide Snowy to Tintin’s aid against a big dog, and the cut scenes are intelligently interspersed with the action and QTE elements that the game starts to stretch its legs and set itself up as a quality title. The graphics are really good, with a super sharp look that is not a million miles from the quality of the movie, and all the characters are brought to life with a lot of care and obvious love for the comics. It all animates really smoothly and I didn’t seen one instance of slowdown throughout the game. The game is constantly providing gameplay variety; you never know what you are going to be doing next, and the cutscenes are very well made and integrate with the game perfectly. The only problems I have with this game is that, first of all it is a bit too easy and I also feel that it is too linear. I would love to be able to go off the beaten track and explore and investigate with Tintin, properly questioning people and piecing the puzzle together myself. Maybe it is the Monkey Island fan inside me, and I understand that this is a movie game that has to follow the plot, but I felt a little more freedom would have made a big difference here. Overall, this game doesn’t actually put a foot wrong, and there is even a host of unlockables to be found. 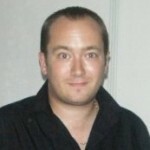 Gameloft have done a professional job and helped to increase the reputation of movie conversions with a high quality release. I would love to see Revolution Studios have a crack at a more free form Tintin title, but as it stands if you are a fan of the movie, then this is a great companion to it. Wow its really nice adventures game.